Arsenal manager Arsene Wenger has dismissed claims from former Gunners midfielder Paul Merson about the club's medical treatment of players. Merson, 43, who played under Wenger during the 1996-97 season, claimed in French magazine So Foot that players were injected with a "yellowy product". He also said that Wenger himself had handed out "a dark tablet", which was super-strength caffeine. But Wenger said on Friday: "I cannot take that comment seriously." 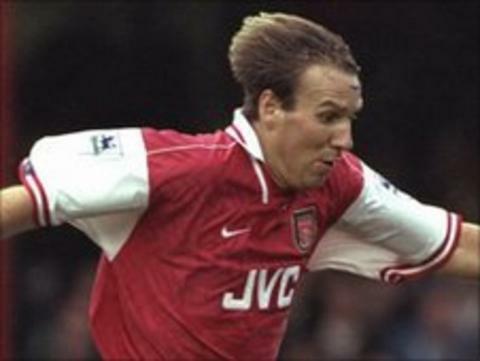 Merson played 423 times for Arsenal, scoring 99 goals before he was sold by Wenger to Middlesbrough at the end of the 1996-97 season. But the remarks from the former England international, who has a history of drug, alcohol and gambling addictions, have led to an angry response from the Frenchman. "I don't know how many players have played here over 15 years, 200 maybe," said Wenger. "I personally give them nothing. If they don't want to take anything, they take nothing. "If you find one player who I asked to take something, bring him here in front of me. If we give them something, it is multi-vitamins, magnesium, calcium or vitamin C like everybody else. "Every year we have at least 20 doping controls. In 15 years we have not had one positive control. You think, really, I try to dope? "If you find one player who I asked to take an injection to play one game, no matter how big the game was, I would resign tomorrow morning. "It is absolutely ridiculous to put any suspicion on the way we treat the players and respect the players' health."